(Nanowerk News) A century after Albert Einstein said we would never be able to observe the instantaneous velocity of tiny particles as they randomly shake and shimmy, so called Brownian motion, physicist Mark Raizen and his group have done so. 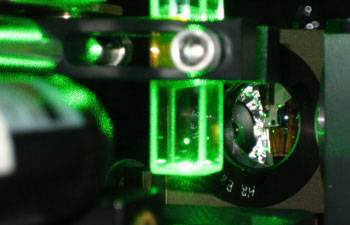 A 5-micrometer glass bead levitated in air by a single laser beam from below. This optical trap is formed by the force from the laser beam and the gravitational force on the bead. Tongcang Li, et. al. used a similar optical trap to study the Brownian motion of a trapped bead in air with ultra-high resolution. Their paper is published in Science. "This is the first observation of the instantaneous velocity of a Brownian particle," says Raizen, the Sid W. Richardson Foundation Regents Chair and professor of physics at The University of Texas at Austin. "It's a prediction of Einstein's that has been standing untested for 100 years. He proposed a test to observe the velocity in 1907, but said that the experiment could not be done." In 1907, Einstein likely did not foresee a time when dust-sized particles of glass could be trapped and suspended in air by dual laser beam "optical tweezers." Nor would he have known that ultrasonic vibrations from a plate-like transducer would shake those glass beads into the air to be tweezed and measured as they moved in suspension. The equipartition theorem states that a particles' kinetic energy — the energy it possesses due to motion — is determined only by its temperature, not its size or mass. Raizen's study now proves that the equipartition theorem is true for Brownian particles; in this case, glass beads that were three micrometers across. "We've now observed the instantaneous velocity of a Brownian particle," says Raizen. "In some sense, we're closing a door on this problem in physics. But we are actually opening a much larger door for future tests of the equipartition theorem at the quantum level."